A unit at 90 George St. that was upgraded with security features. An alarm is sent if the door to the balcony is opened. 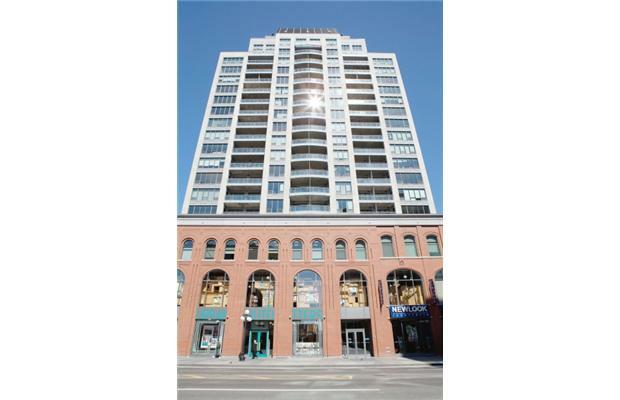 Let’s look at 90 George St. in the ByWard Market. 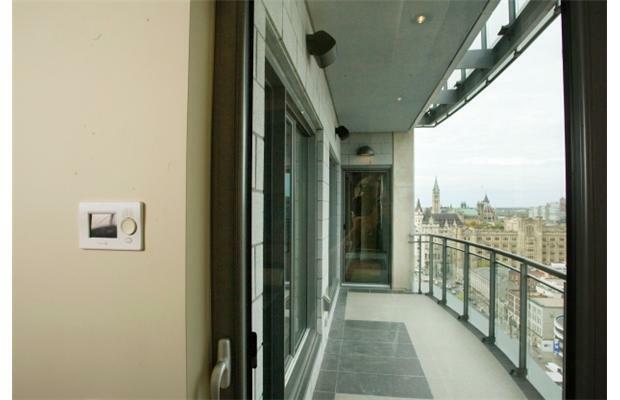 This upscale, beautiful highrise condo building offers top-level security. It starts with 24-hour security staff to monitor the lobby and control access to the living areas via personal and video surveillance. Condo owners can customize announcements of visitors to their personal requirements. Don’t want to be bothered after 9 p.m.? Done. Visitors’ cars are valet parked, a clever idea that extends smart security to the garage. Guests cannot park themselves and are announced to the condo resident before they are admitted. Garage security doesn’t end there. There are large, well-lit emergency buttons on the pillars at every level, adding a welcome sense of security for owners arriving home alone or late at night. This condominium, then, seems to have the ultimate in building security. However, there is another level of security that can be tailored to an owner’s requirements. To explore this further I spoke to Gary Bush of Bleeker Stereo and TV. Bush, who knows everything about home IQ, offers the key to raising your condo’s intelligence from smart to genius. There is a seemingly endless array of intelligent security features, many of which boggle the mind. These features work at the unit level and range from simple intrusion-detecting devices to complete “electronic environments” that can be monitored and controlled worldwide via phone or Internet. We all know guys love their remotes. Bush can take six remotes and bundle them up into a single unit that controls the TVs, DVD players and sound system. Intelligent controllers can raise or lower your blinds according to pre-programmed criteria, save you money by micro-managing your heating and air conditioning, and even track energy consumption. This information can be used to fine tune your system to make it even more efficient. In fact, if you give up the remote, you don’t even have to be in town to run your system. It can be done from your iPad or iPhone. Virtually anything you can think of can be controlled this way, although probably not your appetite. Don’t worry about making holes in your pristine walls — upping your condo’s I.Q. can be achieved wirelessly using radio frequency or infrared devices. We’re talking invisible here. Each time your alarm system is de-activated and re-activated, you can be notified. As for TVs, the new generation of über-thin units comes Internet-ready, voice-responsive and controllable from your iPad. Are you out of town and just remembered to record 30 Rock? Don’t worry, just pull out your iPhone and presto, it’s done. Your condo can easily have high-quality sound in every room — generated by hidden amplifiers and flowing from nearly invisible ceiling speakers. Is your CD collection a bit tired? Don’t worry. You can stream a limitless variety of music from the Internet via your iPad or tablet. If you hear something you like, you can add it to your personal collection by downloading it instantly from iTunes — Apple stock needs the boost. Raising your condo’s I.Q. doesn’t just give you peace of mind, it can also save you time and make your life more enjoyable. It’s great that your lights come on in staggered fashion at sundown, that the blinds go up or down at sunset and that the heat can be regulated from afar. It’s even better that you can enjoy music and mood lighting at the touch of a button. Smart condos make good companions.